As I was contemplating what to write my post about this month, (yeah, I think everyone gets writers block once in a while) I suddenly realized how quickly the holidays have descended upon us again! And when I looked back over some of my old posts, I realized that not only has it been about three years since I have written about the holidays, but I have also never written one about Thanksgiving! I decided to update my holiday article from three years ago, not only to add some important updates and edits, but also to include Thanksgiving and the things that somehow always seem to happen at that time of year. For many of us, the Holidays are such an exciting time: family and friends gathering around, sharing laughs, some songs, sharing old memories, and creating new ones. You spend weeks preparing for it, who to invite, how you are going to fit everyone around the tables, what you are going to serve…. You put so much time, energy and love into every aspect of this. You think of each adult and child (this one is vegetarian, that one may have a milk sensitivity) and you think you have covered it all. But have you? Let’s face it, you can’t possibly plan for EVERY ‘surprise’, but you can take steps to keep any negative ones to a minimum when it comes to all the children that will be there and any pets as well. Visiting Family: As far as Thanksgiving goes, we have all heard thousands of times that that is the most traveled day of the year. This holiday is very synonymous with ‘Family.’ For many of us, ‘family’ also includes the family dog! So if you want to bring Fido along with you, please read my post How To Travel Safely For The Holidays With Pets AND Kids This will give you quite a bit of information on everything from car and air travel to a helpful list of what to pack for your pup. And I will add one more tip that was not in that post… if you are planning to go away without Fido, make sure to book your reservations for him at your favorite boarding facility or dog watcher in advance. I do private in-home boarding in my house, and only take a limited amount of dogs…. and some of my regular clients booked me for the holidays as early as August! So having covered the traveling with your kids and pets over the holidays, I have compiled a list …. starting with all the very pretty things that come hand in hand with the holidays, things that seem innocent enough, but can become a deadly hazard. As a dog trainer, I often hear, “I don’t understand…. My dog has never bitten anyone before!” It is very important to keep in mind that this is not your dog’s normal setting. With their heightened senses, the constant noises and the mouth-watering aromas of all the fantastic food being prepared can be overwhelming to them – and lets not forget the Football game playing on the TV at peak volume! My family was never huge into sports, but I have been to some Thanksgiving dinners where ‘watching’ the game can get pretty loud and boisterous! With all of this going on, your dog may not react the way they typically do. Your pet may be a mild and quiet little thing, or generally pretty social and outgoing…. But just because you enjoy the hustle and bustle, don’t assume your pet will too. A sweet child innocently reaching over to pet the dog while he is overwhelmed can lead to a bite. They might be much happier having a quiet space away from it all. And if they tend to startle easily, or be a bit skittish, it is probably best to crate them, put them in another room, or possibly think of boarding them somewhere for the night. 1. Danger to your Pet. Young children tend to drop things and keep going. 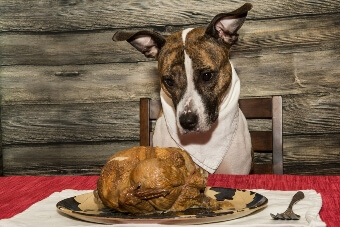 There are certain foods that are not only potentially dangerous, but toxic to your pet. 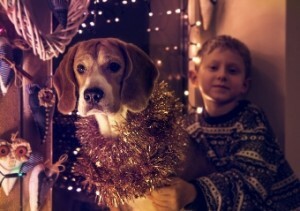 See Pet WebMD’s comprehensive list of holiday no-no’s for your pet. 2. Danger to your Child. Worse than a child accidentally dropping their food and continuing on, is the child that realizes they have dropped it and goes back for it, just to find out it is already in Fido’s mouth. A toddler trying to reclaim their food from a dog who just received some seriously ill-gotten-goods can become a very high risk for a bite. One suggestion I would make is to bring an exercise pen with you. My favorite one is the one without the door made by MidWest. I like this one because it both opens and folds very easily, and comes in numerous heights depending on how large or small your dog is. You can fold into any shape you want, or open it up all the way to block a large entryway or doorway. It is a very versatile item. More often than not, drinks tend to be all set out on one table. The bottles of wine and beer are right next to the bottles of soda. This is potentially a ‘free-for-all” for experimenting teens. I have been in recovery for a long time, and attend 12 step fellowships meeting regularly, and I wish I could say that I never see ‘members’ under the age of 21…. But I can’t. I am seeing more and more young people attending meetings. And when I listen to their stories, more often than not, they begin with drinking the ‘free-flowing’ alcohol served at their family’s parties. Make a separate table for the liquor, and designate one or two adults to serve. And while I am on this subject, medicine cabinets are another very serious danger. We are in the middle of the worst opioid crisis the U.S has ever seen. Opiods are narcotic pain killers (Vicodin, Percocet OxyContin and Fentanyl) which suppress the central Nervous System. All of these medicines are highly addictive, and according to the National Institute of Drug Abuse (NIDA) ‘have led to more deaths in the past few years than car accidents, diseases and guns.’ In August, the US declared this epidemic a ‘National Public Health Emergency’. Has anyone in your family had surgery or dental work recently that required pain medicine? If you are not addicted to pain pills, then you probably think nothing of leaving the left over pills in the medicine cabinet. Years ago, when I was using, we had a name for pills that had labels on the bottles identifying them as narcotic or ‘May Cause Drowsiness.” We called them ‘party invitations’. Please go through your medicine cabinets and either get rid of them or lock them up! Even though it is cold outside, drowning accidents are not exclusive to summer only. Make sure the pool out back is securely locked or gated. One suggestion which may keep young kids, tweens, and teens all out of trouble and occupied, and allow parents to relax and have fun…. Set up a ‘babysitting’ scenario. Figure out how many of each group you are going to have, and ‘assign’ a child or two to each older child. You can even pay them a small fee for doing the service! Assign age appropriate younger kids to older ones. Give a kid no guidance and too much freedom, you are asking for a bored kid to look for trouble, but assign them a responsibility, and throw in the possibility of some monetary gain, and more often than not, they will step up to the plate. Sorry Mom’s and Dad’s, the dog needs to stay with you! Children and animals should never be left alone together unsupervised. If you can’t watch the dog, I do not suggest just locking him in a room. He could get very stressed out, and if someone accidentally opens that door and he charges out in panic, someone could get hurt. The safest place for your dog if you can’t watch him is in a crate.